Kalpana is a Python script that converts ADCIRC output files to ArcGIS compatible shapefiles and Google Earth compatible KMZ files. The code accepts NetCDF formatted ADCIRC outputs for maximum water levels, wind speeds, wave heights and peak wave period and converts these to polyline/polygon shapefiles and polygon KMZ files. The code is also capable of converting timeseries ADCIRC outputs for water levels, wind speeds and wave heights into polygon shapefiles. 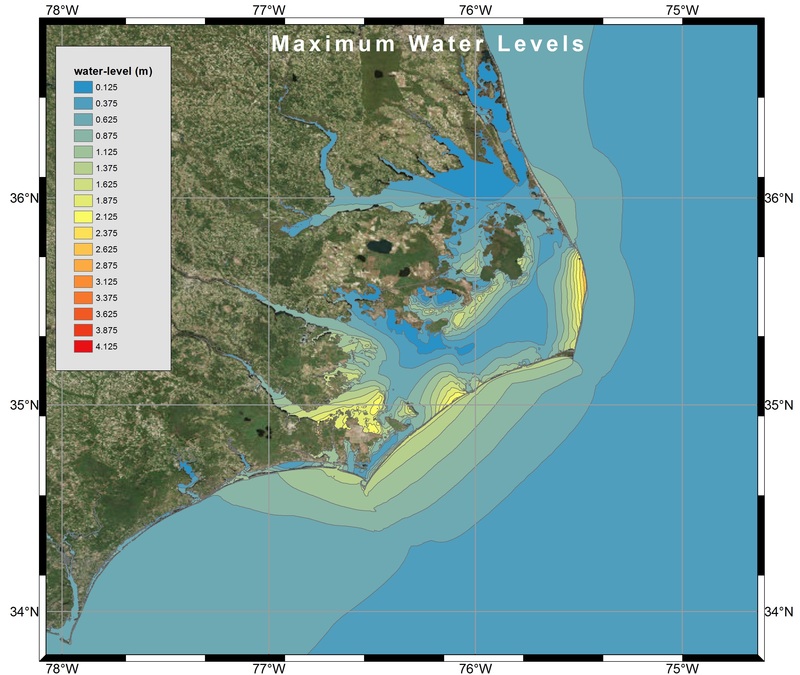 Visualization of Maximum Water Levels along the North Carolina coast during Hurricane Arthur (2014) using polygon shapefiles created by Kalpana with ArcGIS satellite imagery. Kalpana was built by Rosemary Cyriac, and her efforts were aided by the initial attempts of Rich Signell (USGS) and Rusty Holleman to generate shapefiles from ADCIRC results. Jason Fleming improved Kalpana and incorporated the code into the ADCIRC Surge Guidance System (ASGS) that he maintains at the Renaissance Computing Institute (RENCI). The latest version of the code is maintained at our GitHub repository: https://github.com/ccht-ncsu/Kalpana. Kalpana utilizes specialized Python libraries to carry out specific tasks. Please visit the following links for a more detailed description of these libraries, their installation procedure, how Kalpana works, how to run Kalpana with examples, and recent improvements made to Kalpana. At the top of this page, we show an example visualization of maximum water levels in a GIS shapefile. And below, we show an example visualization of maximum significant wave heights in a Google Earth KMZ file. There are many more examples at the links above. 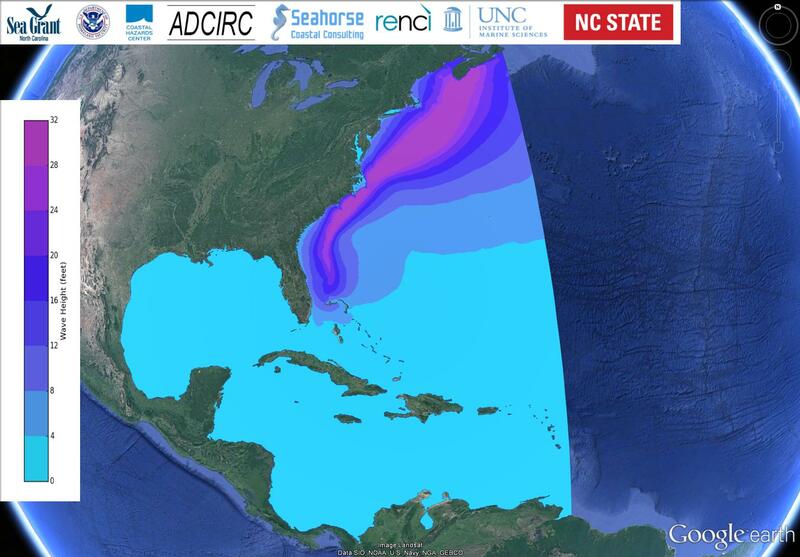 Maximum Significant Wave Heights during Hurricane Arthur (2014) visualized in Google Earth using KML files and screen overlays created by Kalpana.